VMfitness: Current Workout Split, Leg Workouts, and About Time Protein Review! Current Workout Split, Leg Workouts, and About Time Protein Review! Hello all you health addicts! Today I'll be posting for you my current workout split and my leg workouts, if you haven't already seen them on my IG! Anddd of course, another review! Finally catching up with them all! The workouts will be at the end of the post! I first originally found out about this Protein Powder from Vevian over at Fitalicious.me when I was browsing through her delicious and CLEAN recipes! (If you haven't go check out her site NOW!) I've followed her since the beginning of my fit journey and her clean recipes and fitness motivation has definitely helped me so much!!! What caught my eye was that this protein has ZERO CARBS! Perfect for those low carb days or those on a specific diet! As you can see above, it is completely natural and uses 100% Whey Protein Isolate! Many other proteins out there always have a bunch of mumbo-jumbo mixed with their powders, but not About Time! Also, it's lactose and gluten free, for all you food sensitive people out there! And PERFECT for my new gluten free diet! YAYYYY! 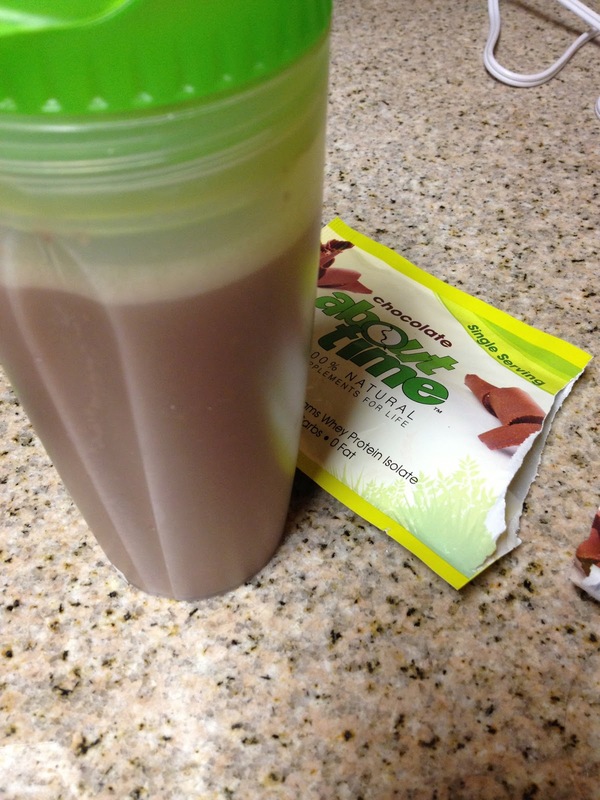 About Time's All Natural Whey Protein Isolate is the cleanest protein on the market. 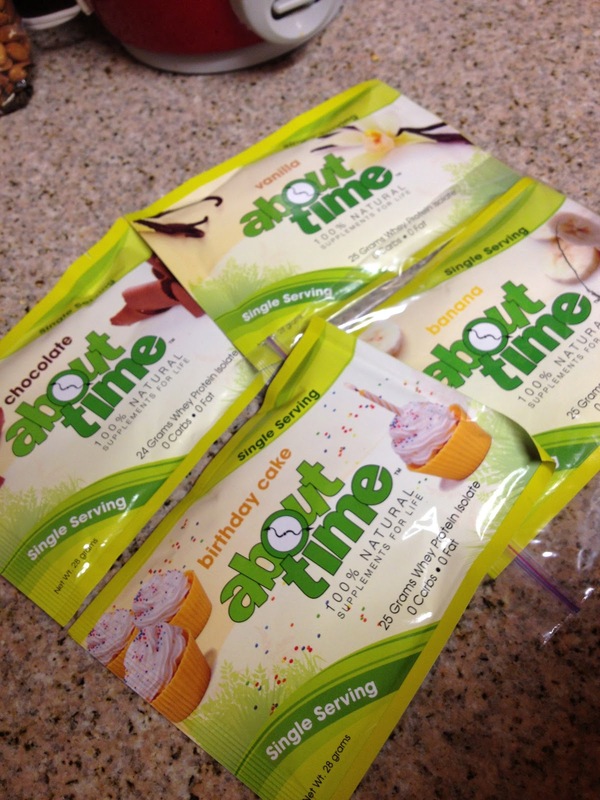 About Time holds a high standard of quality ingredients with zero sugar, zero carbs, and zero fat. 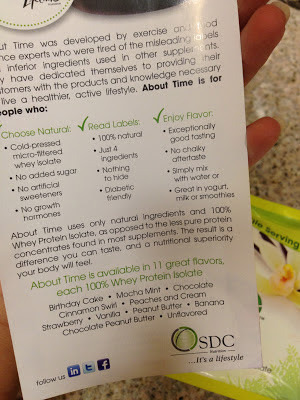 About Time's All Natural Whey Protein Isolate is one of the only whey protein products without artificial ingredients and we also use Stevia as our sweetener, which is an all natural sweetener. All protein supplements are not equal. Unlike most other products, About Time's all natural whey protein is cold-processed micro-filtered whey isolate which means the protein is absorbed more efficiently into your system. Most other protein supplements offer misleading labels and health claims, but About Time keeps it simple and 100% all natural. Just look at the label – only 4 ingredients! High protein, clean ingredients, lower calories than most other proteins that add a lot of other things into their mixes, and NO CARBS?! Sounds pretty dang perfect to me! About Time was nice enough to send me some single serving sample sizes to try out and review for you all! They gave me the flavors: Banana, Vanilla, Birthday Cake, and Chocolate! Taste Test: put finger in packet and lick test & mixed with water test, to get the full flavor of the powder. Chocolate: This is a very nice and simple chocolate flavor. No hint of any artificial sweetness at all! (And I hate the artificial sweet taste, so this is good!) It can be compared to unsweetened cocoa powder, but not as bitter. 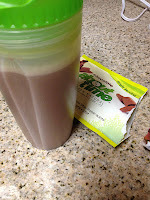 Great chocolatey taste, and I bet it would taste just like a chocolate milk shake when blended with almond milk and ice! Birthday Cake: This had more of a vanilla-ish taste to it! Right when I opened the bag I could smell a lot of sweetness! So this can definitely cure any craving you're having for some real cakes :] It won't taste EXACTLY like a cupcake, but gets the job done! Vanilla: Very mild with a hint of sweetness! Not toooo pungent, but not too bland either. This would be a perfect flavor in any baking recipe because it's not too overpowering! Banana: Intense banana flavor. Didn't really enjoy this one too much. It had an artificial banana flavor to it, kind of like those banana candies? Very sweet and banana-y if you catch my drift. But I bet this would go GREAT in any baking recipe when the flavor is not too strong, like in a banana bread or protein bars or mug cakes! Or mixed with almond milk! Flavors: GREAT! They have more flavors than the ones just mentioned above too! I think my favorite would have to be Chocolate, and maybe my least favorite is the Banana. Powder itself: Awesome mixability (is that even a word?). Didn't clump up, mixed real well even in just water! I am a HUGE fan of this protein powder. Super clean, all natural, zero carbs, and great flavors. I recommend this to ANYONE and will definitely keep it a staple in my protein shelf! These would be the PERFECT protein powders to use in baking recipes too! Gives a great taste and great nutrition and macros! I'll be turning to this on my low carb days, and it's one of the best clean powders out there! They even have a PEANUT BUTTER flavor! You know I'm addicted to any kind of Nut Butter... I will need to get my hands on this ASAP! Make sure to try ABOUT TIME! You can order single serving sizes from them if you want to try a certain flavor before committing to a whole tub! You won't regret it! Check out my INSTAGRAM for the rules on how to win a free tub of About Time Protein!! Just because a few of you have asked when and how often I work out, thought I would just post it here on my blog so it's easier for everyone to view! Remember the importance of REST! Your body and mind need it!! There you have it! Nice and simple! I'll be posting more workouts on my blog so you guys can get an idea of where to start! Here are my current leg workouts! I'll probably do these for a month, and then switch them up so that my body doesn't get too used to the same thing! Here ya go! If any of you try it out, let me know how it goes! Do you feel the burnnnn in your quads and glutes?! Remember, LIFT HEAVY, where you're near failure on your last rep! You won't get a tight and toned bod from doing endless hours of cardio!